St. Petersburg’s Church of Our Savior on the Spilled Blood, seen from Nevsky Prospekt, a few blocks away, and with the city’s plethora of overhead wires on display, as well. 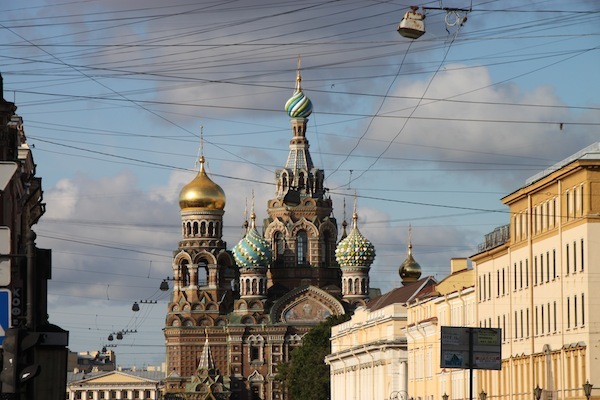 This is the final installment of Nadine Godwin’s series on St. Petersburg. Read her other articles here and here. ST. PETERSBURG, Russia — The Church of Our Savior on the Spilled Blood is a unique name, but this one also has been called the Church on the Potato because, for a time, the Soviets used it as a warehouse for food. I visited the mosaic-covered interior of this ornate building during visits to Russian Orthodox churches while on a press trip sponsored by the St. Petersburg Tourism Committee. We visited three churches, on a Sunday morning as it happened. Spilled Blood, a handy shorthand name for this one, sits on the site, beside Griboyedov Canal, where Tsar Alexander II was mortally wounded by assassins (1881). It was built on that spot and in the style of the 14th to 16th centuries on orders of the dead tsar’s son, Tsar Alexander III. This was a private memorial to Alexander II and not open to the general public. The church boasts many colorful domes and looks a lot like St. Basil’s in Moscow. We see the domes’ resemblance to onions, but they are meant to imitate candlelight, “symbolizing the light of Christ,” our guide Tanya said. 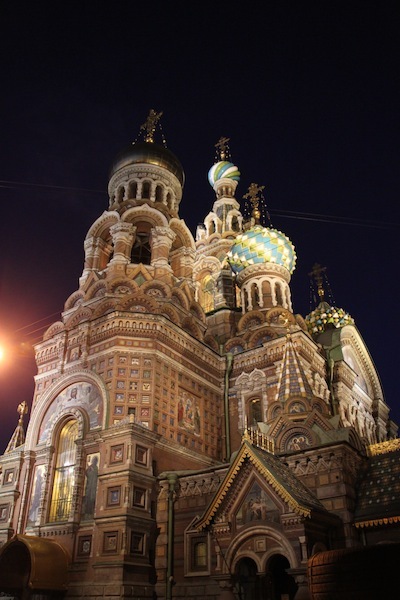 St. Petersburg’s Church of Our Savior on the Spilled Blood, seen at night, when it looks a bit like frosting on a cake. The mosaics that line interior walls, depicting the life and deeds of Christ, comprise Russia’s largest collection of mosaics (covering more than 75,000 square feet). Samples of the mosaics that cover the walls inside St. Petersburg’s Church of Our Savior on the Spilled Blood. Further, the floor is marble as is the central iconostasis at the front of the church. 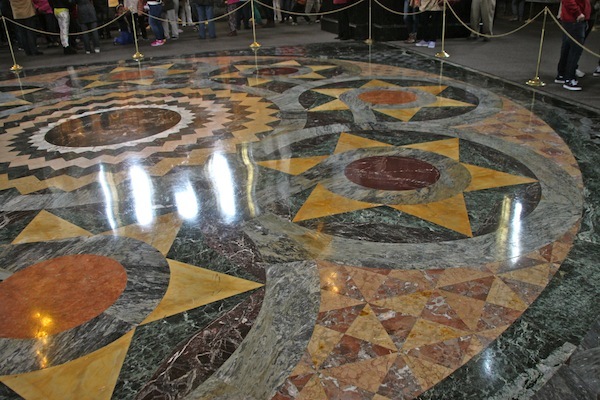 Decorative marble floor inside St. Petersburg’s Church of Our Savior on the Spilled Blood, roped off for protection from countless visitors. 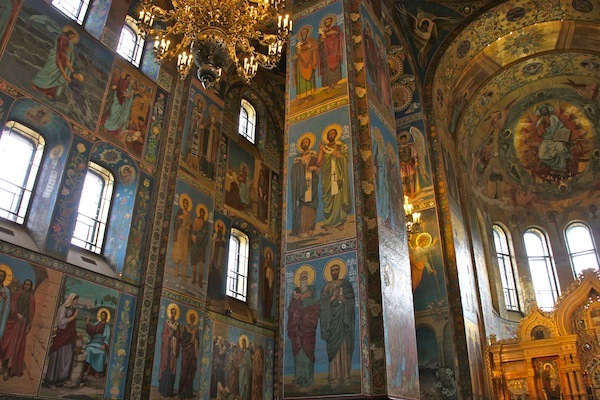 After using the church as a warehouse, then as a morgue during the Nazis’ siege of Leningrad, the Soviets saw the church’s touristic value and undertook a full restoration, starting in 1970. That took 27 years, longer than the 24 required to build from scratch. Early on, restorers extracted a live shell, which had hit the church in 1944. The biggest part of the project was cleaning the mosaics, Tanya said, adding that 90% are originals. The church was consecrated on Aug. 19, 1907, and reopened on Aug. 19, 1997. This is a very impressive place to visit. What a shame we tourists do so much in a hurry. Kazan Cathedral in St. Petersburg, which was a museum in Soviet times. 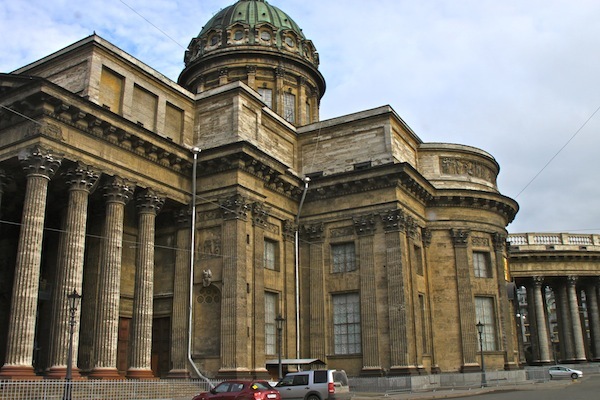 The exterior of Kazan Cathedral, on St. Petersburg’s broad Nevsky Prospekt, is distinguished by its sweeping arc-shaped colonnade. 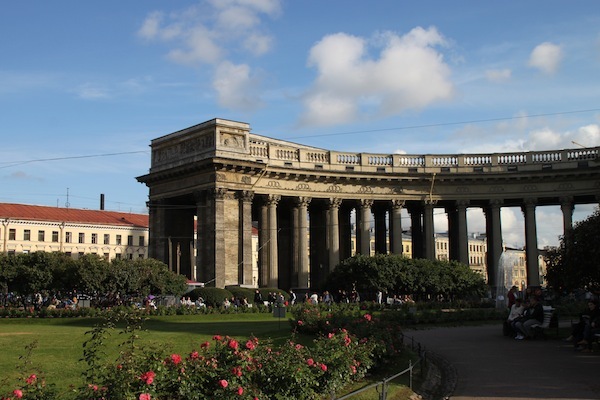 One wing of the arc-shaped colonnade that fronts Kazan Cathedral on St. Petersburg’s Nevsky Prospekt. Now an active church, it was the Museum of Religion and Atheism for part of the Soviet period. Given our press group visited on a Sunday, we were strolling in the background during a service. Tanya said the official rule is that photos are not allowed in any active church, whether a service is under way or not, but the reality depends on how strict the local priest is. I blindly took photos while my camera hung from my neck, then straightened the shots with iPhoto. This cathedral, built between 1801 and 1811, is a big, heavy-looking building — the opposite of delicate — but with attractive decorative features, just the same. 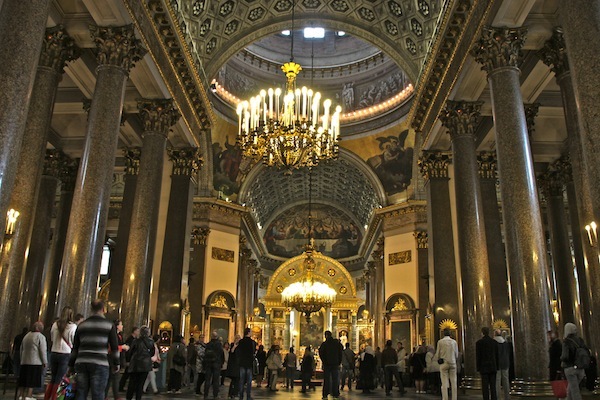 Interior of the Kazan Cathedral in St. Petersburg, during a Sunday service. Inside, the centerpiece for the faithful is an icon of Our Lady of Kazan. We could see worshippers kissing the icon, or “venerating” it, as Tanya said. I figure it was a great way to spread disease. This service was memorable for the chanting.